I can’t believe that the month of November, my last full month in Swaziland, has come to a close. Very soon I’ll be swapping the African sun for Canadian snow! With only a couple weeks left, I’ve been working to finish up my assignments in the office, continue learning about and experiencing other sport organizations in Swaziland, and fitting in some exciting trips where I can. This month started off with an incredible weekend spent in Kruger National Park. I left Swaziland on a Friday morning, heading north into South Africa, and entering Kruger at Crocodile Bridge. Our group camped in tents at the Lower Sabie campground, where we could hear the hippos in the river right beside our camp, as well as the lions one night! I wouldn’t call myself a morning person, so I wasn’t too sure how to feel about our 4:00 am wake up calls at first. But I have to say, I have never been so excited to wake up before the sun and start the day. Each morning we would wake up, have some coffee, hop into our safari truck, and head out into the park by 4:30 am, an hour before the park gates were open to the public. 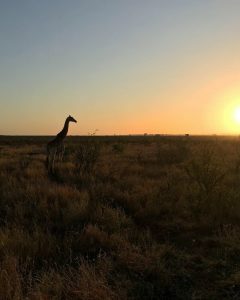 We would drive around, watching the sunrise with giraffes, zebras, and whatever else we came across along the way. Throughout the trip, our group was incredibly lucky to see all of the Big 5, which includes lion, leopard, buffalo, rhino, and elephant! We also spotted some Afr ican wild dogs during our time in the park, an incredibly rare sight, as their numbers are very low; about 500 in all of Africa! 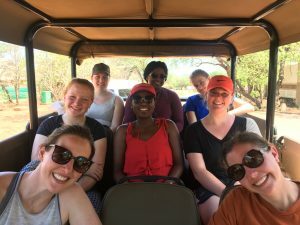 Our guide was also really knowledgeable, teaching us about the different animals we saw each day, as well as about the nature and environment around us. I left Kruger feeling incredibly inspired and happy, not wanting to leave the beauty of the park, the animals, and the wonderful people I met while I was there. If Kruger isn’t yet on your bucket list, I highly recommend adding it! It’s truly an awesome place that I can’t wait to re-visit. In the EOCGA office, I have been working to complete my main project of an enhancement framework for the organization’s anti-doping program. I have taken time to reevaluate my recommendations and make sure I am providing suggestions that I really believe will benefit the organization and make sense for them. This month, I also got the chance to spend a day with the Swaziland National Sport and Recreation Council, another main governing body of sport in the nation and an organization that EOCGA works closely with to achieve their shared goals. 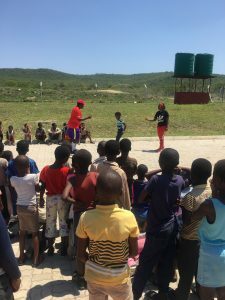 For the project that I joined, the council partnered with UNICEF and some of the volunteers they have in Swaziland to put on a workshop in the rural town of Sithobela, which included a variety of community members such as teachers and coaches. This was a week-long volunteer training course that focused on guiding the group to the creation of a homework and sport club that they are working to organize at their local sport and community center. This program is aimed at engaging youth in primary and high school, giving them a place to come after school, complete their homework, receive assistance and mentoring, and play sports or other games before they head home for the evening. The program also aims to t each other life skills, including trust, responsibility, respect, fair play, care, and community, encouraging the youth to take charge and make a difference in their communities, as well as grow as an individual. On this last day of training, the volunteers got to practice all of the skills they learned throughout the week, as a group of about 80 children from the local primary school came for a morning of games and activity, all lead by the volunteers. The kids played netball, completed an obstacle course, and learned some rope jumping skills. The day was a hit, and a great introduction to the program for the community of Sithobela. Certificates were awarded to all of the trained volunteers, and we finished off the very warm day with a delicious lunch. Near the end of the month, I went on a second little trip to South Africa, this time to Cape Town! 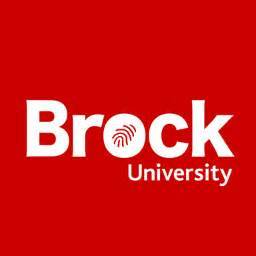 For this weekend getaway, I was joined by Ashley and Luke, my fellow QEScholars and Brock peers that are out in Botswana. The three of us met in Johannesburg and flew together to Cape Town, somewhere none of us had been before. While we were looking forward to exploring the city and spending some time by the beach, we were very excited to go cage diving with sharks, something I never thought I would say! After getting picked up at 3:30 am (safe to say I’m good at waking up early now! ), we drove 2 hours outside of Cape Town to Gansbaai, where we then took a boat about 15 minutes off the coast, near Shark Alley. After suiting up in our wet suits, we hopped into the cage attached to the boat while the boat crew tossed bait into the water around us. Unfortunately, we didn’t see any great white sharks like we hoped, but the marine biologist on board was super informative, explaining how changes to their environment and other natural changes have driven these sharks from what was once one of the most popular places to spot the species. We did however, see about 10-12 bronze whaler sharks, which came right up to the cage! It was an incredible experience, one that I hope to do again. The rest of the weekend was spent exploring the V&A Waterfront, Table Mountain, and the other areas of the city. 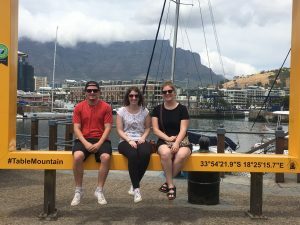 Our time in Cape Town was definitely short, but we enjoyed every moment of the trip and I think we all agree that we need to come back to really experience all it has to offer. It was great to spend time with my fellow QEScholars and share stories about our time in Africa, our work, and how much we’ve learned and grown along the way. Ashley, Luke, and I with Table Mountain behind us. 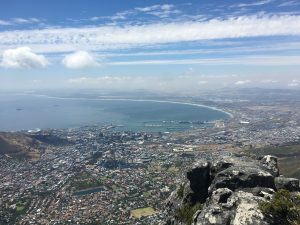 One of the views of Cape Town from the top of Table Mountain. As I complete my last couple weeks of work in the EOCGA office and fit in a few more Swazi experiences, I can’t remind myself enough of how lucky I am been to have spent the last 3 months here in Swaziland. The people I’ve met, the experiences I’ve had, and the things I’ve learned – both about myself and the sport industry – have all impacted me in ways that I didn’t expect. I will leave Swaziland more aware of the differences in sport around the world, the potential it holds, and how the industry is about more than just the sports being played. I will leave Swaziland with a better understanding of who I am as a student, an individual, and a professional, ready to embark on my career journey in the field of sport management. Finally, I will also leave Swaziland with a renewed passion for travelling and a desire for new experiences. I have been thinking a lot about where I would like to travel next, and surprisingly, I think my biggest goal at the moment is to explore more of my home sweet home, Canada! Travelling to other countries reminds me of just how big Canada is and the number of unique cultures spread throughout it. I want to know more about the country I come from and then be able to share that in my future travels abroad. Thanks to everyone who has supported my journey and to all those I’ve met along the way who treated me like family!